Hi there everyone and welcome to Thursday! Just one more day until the weekend officially begins and then I can think about ice cream, right? Seriously, ice cream is a big thing in New England, which is not such a good thing for one's hips! There's a homemade ice cream joint on just about every street corner and the stores are packed from Memorial Day to Labor Day. We have a great little place just about a mile from our house and we make the journey for ice cream at least once a week. Love it! And I love this sweet ice cream-themed stamp set from Sweet Stamp Shop! Isn't it the cutest? 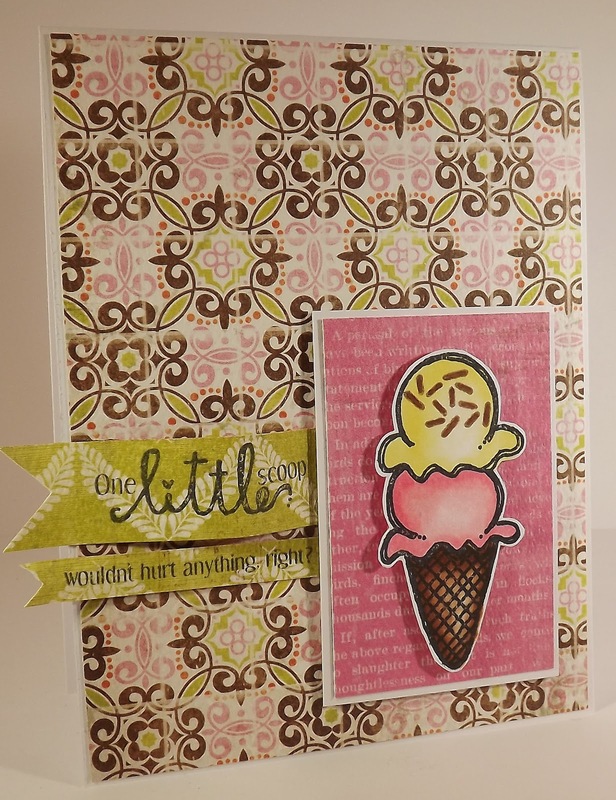 This set, Cool Scoop, contains a whole bunch of sweet treat images that can be mixed and matched. Why you can even create your very own ice cream sundae...how delish! Enjoy folks and enjoy this last bit of summer!! Now go out and get some ice cream!! I'm with you, Kim! I'm not giving up summer until it snows! Love that! And love this card! What a cute image and sentiment and that paper is great!